Welcome to the Town of Fenwick Island, Delaware. Incorporated in 1953, Fenwick Island is a quiet beach town with vibrant neighborhood businesses and seaside homes in between the Atlantic Ocean and the Little Assawoman Bay. The town provides public parks for recreation and maintains a one-mile beach guarded by the Fenwick Island Beach Patrol. 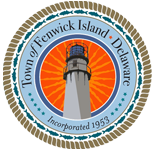 The Fenwick Island Police Department is on duty 24/7. If you have public safety concerns please visit the public safety building or call Town Hall at 302-539-3011. This Web Page you are visiting is committed to notifying property owners and visitors about town information. Town management uses Twitter and Facebook to post information about public meetings, weather events, local news and beach conditions (on Twitter). Other methods of community notification include an LED message board in front of Town Hall, a community message board on Bayard Street, two informative TVs at Town Hall and the Public Safety Building, in addition, the Town Hall lobby is full of local information. If you would like to contact me, please call my cell 703-938-5592, email me at gene_langan@yahoo.com or leave a message with the Town Manager at 302-539-3011.